Either everyone is catching on to how delicious spaghetti squash is or they are trying to eat healthier in the new year because I had a hard time finding spaghetti squash in the grocery stores! I was searching for another product for an upcoming post and had to visit several stores to find it, so I also checked the stores for spaghetti squash. Eventually I did find some and I can’t wait to eat it this week! 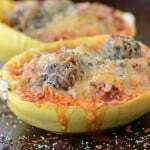 So, today I want to share a recipe for spaghetti squash with meatballs. First, cook your spaghetti squash and remove the strands. (Wondering how to cook spaghetti squash? Here’s my recipe for How To Cook Spaghetti Squash In The Microwave.) Mix in your favorite spaghetti sauce. The amount of sauce needed will depend on the size of the spaghetti squash you cooked. 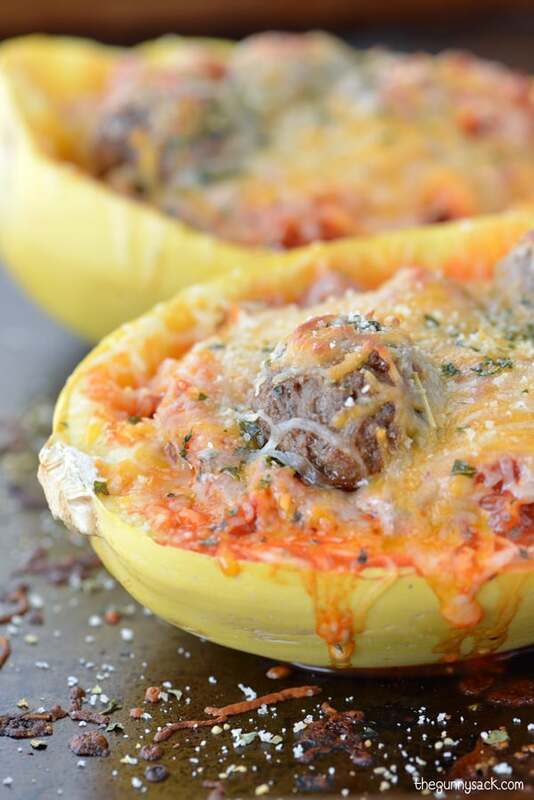 Fill the squash bowls halfway with spaghetti squash and sauce. Add a few hot, fully cooked meatballs. Add some more spaghetti squash, sauce and meatballs until the squash boat is full. Top it all with some shredded cheese and a sprinkle of oregano. Cook the spaghetti squash and meatballs in the oven at 350 degrees for about 6-8 minutes, or until the cheese melts and the sauce is hot. Yummy, cheesy goodness! 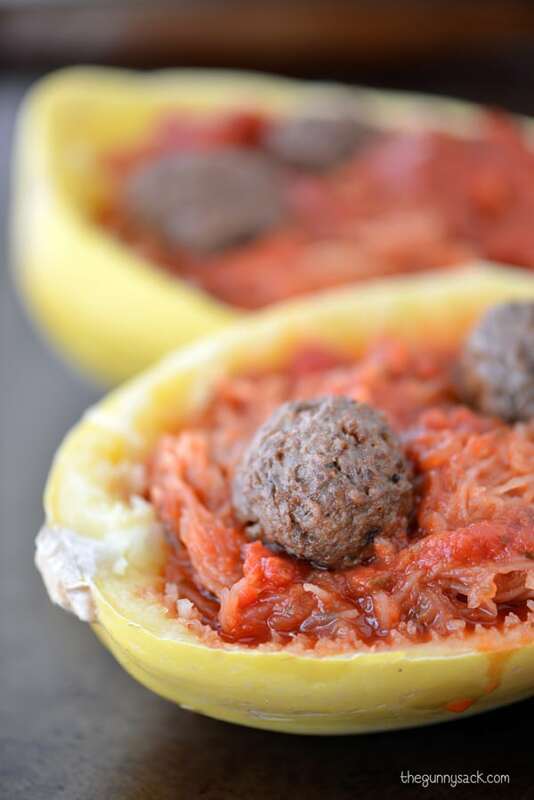 One of the best things about this recipe for spaghetti squash with meatballs is that it is served right out of the squash halves. The squash makes it own bowls or squash boats that are just plain fun! Cook a spaghetti squash, remove the strands and save the squash halves. Cook the meatballs according to the directions on the package. 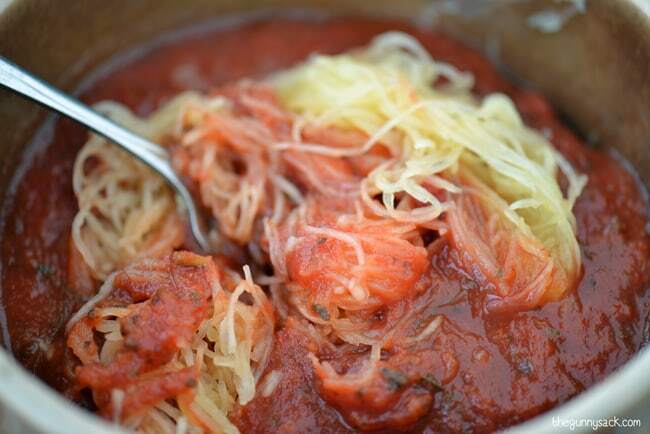 Mix the spaghetti squash with enough spaghetti sauce to fully coat the strands. 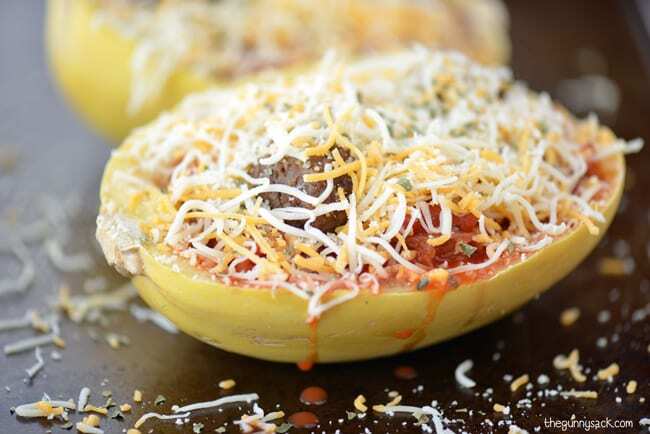 Fill each squash boat halfway with the spaghetti squash and sauce mixture. Add a second layer of spaghetti squash and sauce. Top with with a couple of meatballs, shredded cheese and a sprinkles of oregano. Bake at 350 degrees for 6-8 minutes or until the cheese is melted and the sauce is hot. Follow The Gunny Sack’s board *Best Light Recipes* on Pinterest. Are you kidding me? I was excited by the pictures of your dish, but when I scrolled down to view the recipe. almost everything comes from a jar, pre-made. Won’t be trying this one. I just used spaghetti squash today, one of my favorites. These look amazing! Oh Tonia, this is gorgeous!! I have never tried spaghetti squash. Every time I see, I feel I have to try it, it always looks so good. This is such a fabulous dinner idea. It seems to be hit or miss at the stores near my house with spaghetti squash. Sometimes they have it, sometimes they don’t. When I see it again, I’ll have to pick one up so I can make this. LOVE this idea, Tonia! I have stayed away from spaghetti squash. Not sure why. I guess fear of the unknown. This look so good. I love that it’s you own personal bowl. 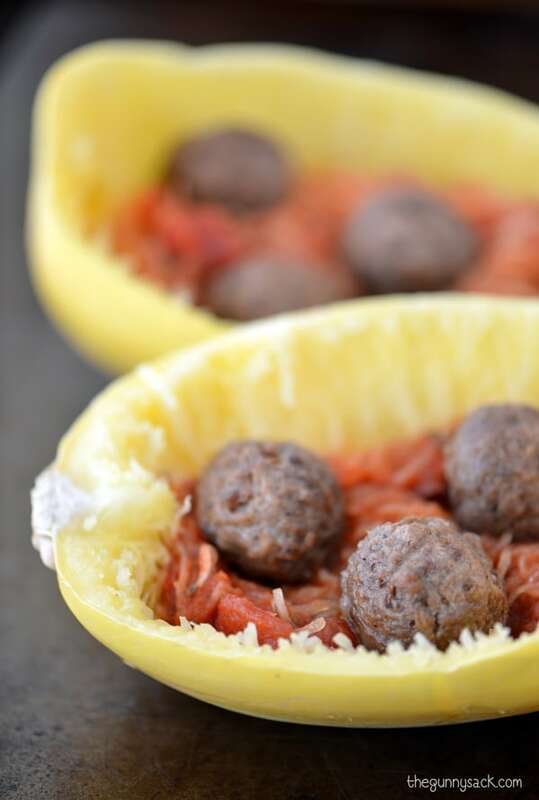 I love my own personal spaghetti squash bowl, especially when it’s stuffed with meatballs! 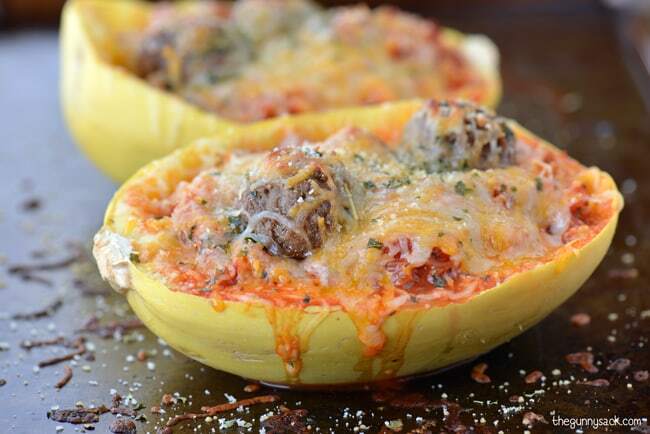 I love that you made them in the spaghetti squash itself. What a great presentation and so child friendly. I just caught on to spaghetti squash towards the end of last year. I eat one a week over the course of a few meals. I am worried I might burn out on it and what would I do without it! I’ve had trouble finding spaghetti squash recently too. It took me 3 stores the other day! And I’m so addicted that I was willing to keep checking! This looks delicious! Oh my goodness, I think I want to face plant into your pictures!!! Delicious friend! Pinning. A really awesome recipe! Great way to ditch the noodles and go healthy. What a great idea! Looks delicious! 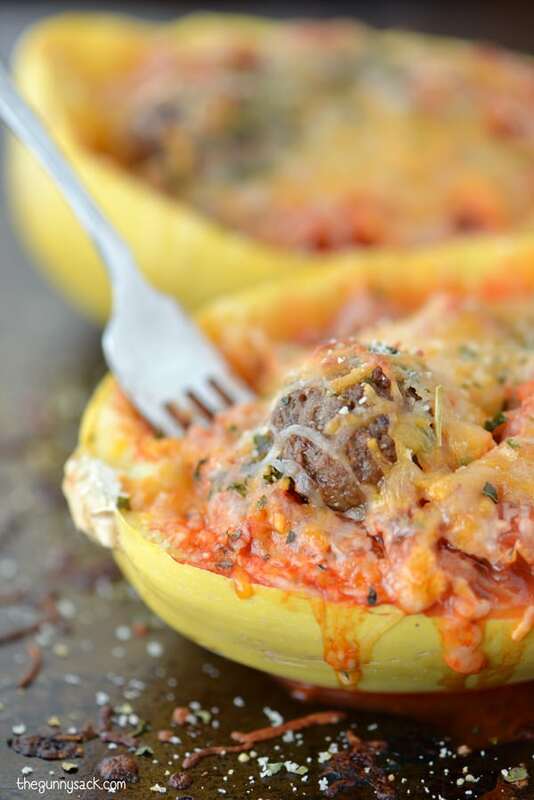 We love spaghetti squash! This looks so good! Absolutely awesome, perfect for this time of year! Delicious! We’re actually having this meal today. Going to try your tips! I am so mad my spaghetti squash went bad! This recipe would have been perfect! In my defense, I did hide it behind my acorn squash and completely forgot about it. Adore spag squash, adore meatballs, so this is pretty much the best recipe EVER!